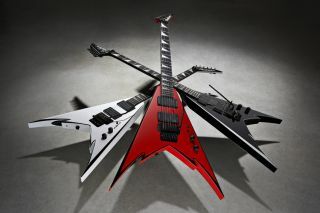 Jackson's new Demmelition King V models. Rawk! Jackson guitars have unveiled a new signature model, the Demmelition King V, designed in collaboration with guitarist Phil Demmel of Machine Head. The Demmelition King V has the line´s classic sharp V-shaped alder body, with a more aggressive twist thanks to its additional cutouts on the Vs. It has a through-body quarter-sawn maple neck, with a bound compound-radius ebony fingerboard (12-16 inches) and 24 jumbo frets. It also has mother-of-pearl shark fin position inlays and black-bound headstock with an inlaid mother-of-pearl Jackson logo. Pickups are by EMG - an 81 at the bridge and a 60 at the neck. Each has its own CTS volume control. Other features include a Floyd Rose Original double-locking two-point tremolo bridge, black hardware and die-cast tuners. It comes in red with black bevels, black with silver bevels or white with black bevels. Most of all, it comes looking very metal. More details from Jackson guitars.